Order Horse and Equestrian Theme bracelets and cuffs online in a variety of styles. Top brands including Kelly Herd, Montana Silversmith, and Lynn Bean Jewelry. Artist Lynn Bean's handcrafted copper bracelet features a pretty Paint horse with feathers in her mane, surrounded by a larger feather design in vivid colors. Diamond-cut edges add some sparkle. Cuff is 1" wide and adjusts to fit most wrists. Gift boxed. Handcrafted bracelet is made from genuine leather and beautifully braided horsehair, accented with a silvertone concho and pink crystals. Snap closure. Specify size: Small is 7" long; Medium is 8" long. Made in USA. Gift boxed. A herd of seven goldtone horse charms slides along two rope chains in this polished bracelet for all occasions. Foldover clasp. 7 1/2" long. Gift boxed. 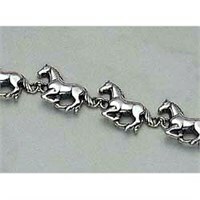 A herd of running horses forms the links on this silvertone bracelet with crystal accents. Magnetic closure for easy on/off. Fits wrists up to 7 1?2". Gift boxed. A Dee bit is a classic design for an equestrienne's bracelet, and this one is beautifully crafted for a slightly dressy feeling. Solid sterling silver bangle has hinged bit latch. Fits wrists up to 7 1/2". Gift boxed. Distinctive wrap bracelet is made from English bridle leather with a split-center design and stirrup-shaped buckle. Choose brown with goldtone or black with silvertone. 18" long. Gift boxed. Crafted in Kentucky. Three raised-relief horses gallop across a hand-crafted solid pewter cuff, with geometric designs etched into the ends. Pliable pewter adjusts to fit most wrists. 1 5/8" wide. Gift boxed. Totally charming bracelet features silvertone and goldtone etched beads with CZ accents and horseshoe charms. Oversized lobster clasp. 8 1/2" long. Gift boxed. Handcrafted copper bracelet by artist Lynn Bean features a white horse with flowing mane, surrounded by a wash of colors and diamond-cut accents. Cuff is 1" wide and adjusts to fit most wrists. Gift boxed. Handcrafted bracelets are made of braided horsehair, accented with colored glass beads. Flat style features a Southwestern pattern. Rounded style is a rolled braid with interwoven beads. Each is 7 1/2" long with lobster clasp. Gift boxed. Silvertone bracelet features a segmented band etched with an inspirational message: To many, the words love, hope, and dreams are synonymous with horses. Dangling horse-theme charms add a little jingle; charms hang up to 3/4". Stretches to fit most wrists. Gift boxed. Silvertone horse is centered in a horseshoe concho decorated with red enamel and a turquoise-colored bead. Snap closure adjusts from 7" to 7 3?4" long. Faux leather band is 1 1/2" wide. Gift boxed. Mix and match the beads on this fun bracelet to create your own look! Features a variety of beads in silvertone with crystal accents and enameled red glass beads. Silvertone snake chain; oversized lobster clasp sports a heart. Fits wrists up to 7 1/2". Gift boxed. Western-theme charm bracelet sparkles with purple crystals and jingles with two-tone horseshoes, saddle, boots, hat and cowboys. Ball beads on both ends. Lobster clasp with horseshoe accent. 8" long. Gift boxed. Three strands of silvertone beads surround a 2" antiqued silvertone concho with tooled design, large crystal horseshoe and crystals around the edge. Stretches to fit most wrists. Gift boxed. This Horse bracelet is like a string of miniature belt buckles. It's so eye-catching, people are going to grab your wrist for a closer look whenever you wear it. 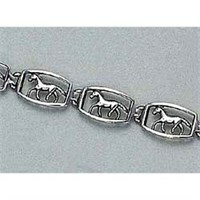 The Horse bracelet measures 1/4 inch by 7 3/8 inches. It is made from sterling silver, so you can feel confident that this piece of jewelry is going to stand the test of time. This bracelet would make an ideal gift for anybody who loves animals. These Horse bracelets are so attractive, you're going to enjoy wearing it with every outfit, from casual to dressy. Our Quarter Horse Bracelet is an outstanding addition to any jewelry collection. Handcrafted from sterling silver, a three dimensional band of running horses form the links of our bracelet. Measuring 7 5/8 x 5/8 inches, our Quarterhorse Bracelet reflects the excellence natural to the breed. Flowing tails and galloping hooves carry the eye forward, and motion is almost felt when admiring one of our Quarter Horse Bracelets. Wearing slacks or an evening dress, you can speak elegance with this fashion accent. Silverplated cuff features a horseshoe nail design with goldtone rope binding at each end. An elegant and understated bracelet for everyday wear. Slightly adjustable; 6 1?4" long. Gift boxed. Scrollwork bangle in antiqued silverplate features four running horses, each with a mosaic of green, red and purple enamel and genuine abalone. Stretches to fit most wrists. Gift boxed. Beautifully crafted Montana Silversmiths bracelet. Fancy silver-tone barbed wire linked bracelet. Rhinestone covered horseshoe charm. Make a statement wearing our Montana Silversmiths bracelet. Montana Silversmiths pride themselves on their high quality and superior workmanship. Imported. Kick up your western wear a notch wearing this western fashion bracelet by Montana Silversmiths! Quality silver-electroplated. Fancy pewter-tone square charms attached by two rows of delicate chains. Fancy engraving, horseshoe designs & sparkling rhinestones stand out against black antique paint fill. Coated with state-of-the-art tarnish protection. Montana Silversmiths skilled craftsmen create inspirational western jewelry women admire. Montana Silversmiths combine traditional designs, unique modern flair, brilliant engraving, and attention to detail. This makes Montana Silversmiths’ jewelry great gifts for you or loved ones. Women's bracelet will look great with any outfit! Bracelet measures 7 1/4" in length. Lobster claw clasp. Beautifully crafted Montana Silversmiths bracelet. Silver electroplated link style bracelet. Features set of small alternating silver horseshoes, encrusted with clear rhinestones on a link silver chain bracelet. Toggle clasp. One size fits most. Make a statement wearing our Montana Silversmiths bracelet. Montana Silversmiths pride themselves on their high quality and superior workmanship. Montana Silversmiths jewelry is a must-have! Silver-tone beads are strung together with strong elastic plastic. Elegant horseshoe charm with rhinestone accent dangles from center of bracelet. Fits securely on wrist; one size fits most. Accent your wrist in true western fashion wearing this Montana Silversmiths bracelet! Montana Silversmiths pride themselves on their high quality and superior workmanship. A gorgeous western bracelet for you! Stainless steel construction. Horseshoe links accented with black paint fill & lovely colorful crystals. Magnets in links offer added durability & rust resistance. Secure clasp closure. Sabona of London makes high quality jewelry for todays fashionable women! This bracelet features stainless steel links with 1200 gauss Samarium Cobalt magnets in each. Secure clasp closure. S(6.5"), M(7.0"), L(7.5"). A lovely bracelet for you! Stainless steel construction. Lovely horseshoe links accented with black paint fill & sparkly clear crystals. Magnets in links offer added durability & rust resistance. Secure clasp closure. Sabona of London makes high quality jewelry for todays fashionable women! This bracelet features stainless steel links with 1200 gauss Samarium Cobalt magnets in each. Secure clasp closure. S(6.5"), M(7.0"), L(7.5"). A gorgeous western bracelet for you! Stainless steel construction. Horseshoe links accented with 18K gold plating & clear crystals. Magnets in links offer added durability & rust resistance. Secure clasp closure. Sabona of London makes high quality jewelry for todays fashionable women! This bracelet features stainless steel links with 1200 gauss Samarium Cobalt magnets in each. Secure clasp closure. S(6.5"), M(7.0"), L(7.5"). A great bracelet for you by Sabona! Stainless steel construction. Links accented with 18K gold horse heads & crosses. Magnets in links offer added durability & rust resistance. Secure clasp closure. Sabona of London makes high quality jewelry for todays fashionable men! This bracelet features stainless steel links with 1200 gauss Samarium Cobalt magnets in each. Secure clasp closure. M(7.0"), L (7.5"), XL(8.0"). These metallic padded two-tone bracelets are made with the same superior quality leather as our padded bracelets and keychains. Black leather will have a stainless steal bit and havana leather will have a brass bit. One size fits 7-8" wrist. MORE at Back In The Saddle Gifts & Apparel and Horse.com.